When our nephew appeared in the open window and waved his father outside I didn’t think much of it. When he appeared again and waved my husband outside and my husband left with his arm wrapped around the boy’s shoulders, I knew something was up. What disaster had occurred to call away all the men in the house? What serious conversations were being had around the corner? What tests of strength were being performed? Was someone hurt? Did a relative die? My fingers itched to put down my coffee cup and call an abrupt halt to this social call. For both personal (curiosity has always killed this cat) and political (dyed-in-the-wool feminist) reasons I was certain that I would be more useful outside this house than sitting here chatting. However, no other family member had my angled view out the window, and the visit dragged on. It was a thing that most adolescents have done in one form or another, but it certainly looked horrible. Mashed-up nose like a prize-fighter, fallen roof tiles, timbers askew, rumpled hood, shattered headlights, a coop of very startled chickens, and one poor, caged guinea pig who had piddled his shorts in face of his near demise. Inspecting the evidence and tracking the trajectory from the truck’s last known position, it was easy to deduce what had happened: youthful curiosity had caused the teenager to climb behind the wheel and attempt to move the vehicle, only to somehow startle himself, and once startled he stomped on the accelerator instead of the brake and went careening into the family’s outdoor kitchen. He managed to wrap the front fender around a huge, weathered support beam, and without its support the roof’s tiles had tumbled onto the hood of the car. 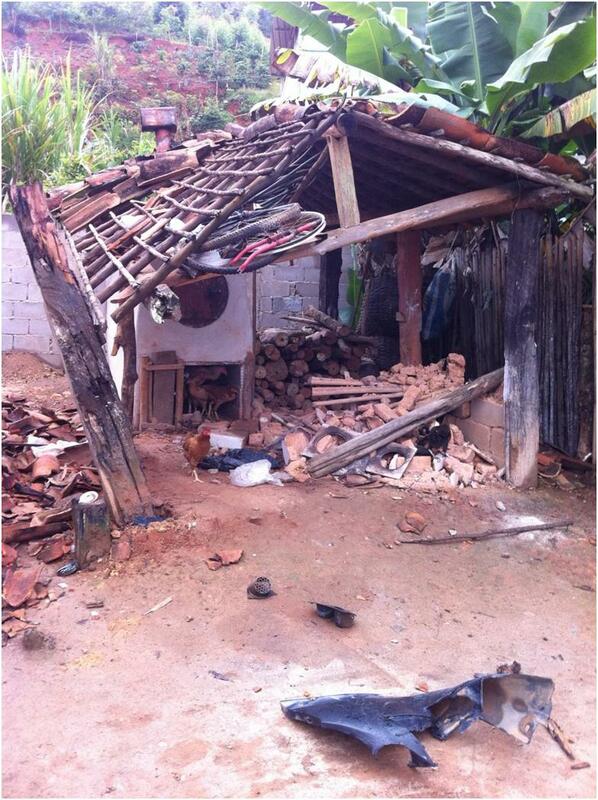 The noise must have been tremendous–engine revving, timber cracking, tiles crashing, and chickens squawking. How we had managed to not hear it two houses away escapes me. Our nephew and his family were in tears with guilt. The remains of the outdoor kitchen and our bumper. After peering at the carcass, we were relieved to see that the frame, windshield, and the engine block were intact. Yes, it looked awful. Yes, we needed to climb into it Dukes-of-Hazzard style to remove it from the rubble, but it was nothing that a hammer and some new plastic parts couldn’t fix. Two more feet to the left and the roof supports could have gone through the windshield and done some serious damage to a much more precious possession–our nephew. Yes, all in all, we were relieved. Our bumper patched back together. Franken-bumper.